Keep your dogs close but your kitties closer, is I think the expression. Maybe. Whatever it is, pets are important to people. And keeping a close watch on them even when you’re not located in the same place has become increasingly possible thanks to the broad proliferation of tech like Wi-Fi connected cameras. Petcube Bites is one of those cameras, but it’s also a treat dispenser, which lets you fire nibblets for your pet back at home from wherever you happen to be, provided you have an active internet connection. Fair warning: This is a much larger unit than your average Nest or Logitech smart home camera. 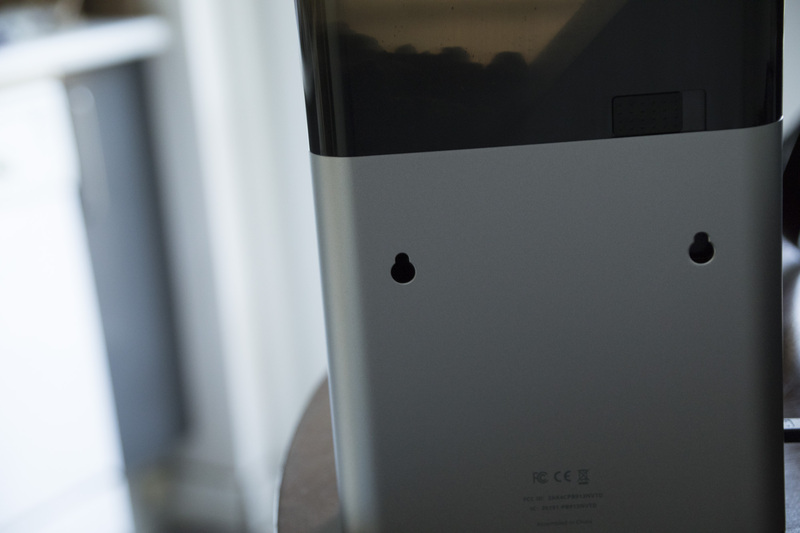 It’s roughly the size of a big encyclopedia, or a couple of Mac minis standing on their thin edge and stacked. The size is functional, however, since it houses a decent-sized reservoir for your stock of treats, as well as an HD camera, a Wi-Fi radio, and a mechanism for actually firing off those treats, with a user-selectable range of up to around 6 feet. Petcube Bites ships with a selection of all-natural treats included, so you can get started using it right away. My dog isn’t exactly discerning when it comes to what she eats (she ate half a pizza box the other day), but I can say that she happily scarfed these down. Setup of the Pectcube Bites is easy if you’ve ever installed any kind of Wi-Fi camera or connected home device before – and it should pose no problem even if you haven’t. It basically involves getting the unit connected to your Wi-Fi network using an app you download for your iOS or Android smartphone. Once connected, the Bites will show up in the app, and you can connect to it to view a live feed from the camera, and to do additional stuff including initiating a two-way voice conversation if you feel like ‘talking’ to your pet. You can also trigger the dispensing of a treat, of course, and this is where the Bites departs from a more rudimentary two-way connected home camera. Using the app, you simply flick up on the smartphone screen to launch a treat. Again, you can set the distance, and after. few seconds the treat will drop into the tray and then get kicked out across the room. I found this worked as designed pretty consistently, although once in a while two treats were dispensed instead of one, which is not really a huge issue, and probably would be described as a feature, not a bug, by my dog. You can also adjust portion sizes, and even set a dispensing schedule if you want them released at pre-set times. My dog pretty quickly learned that the whirring of the little motor within the unit mean that a treat was on its way, so she would appear in frame just before the treat was launched almost every time I sent one her way. It’s amazing how fun it is to play that way with your pet when you have to be away from home. 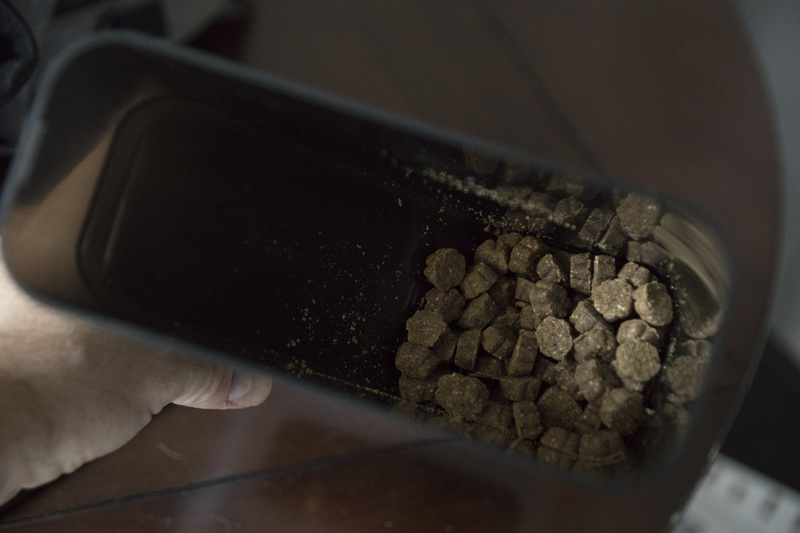 There are some nice features the Petcube Bites offers beyond just the pet treat dispensing. 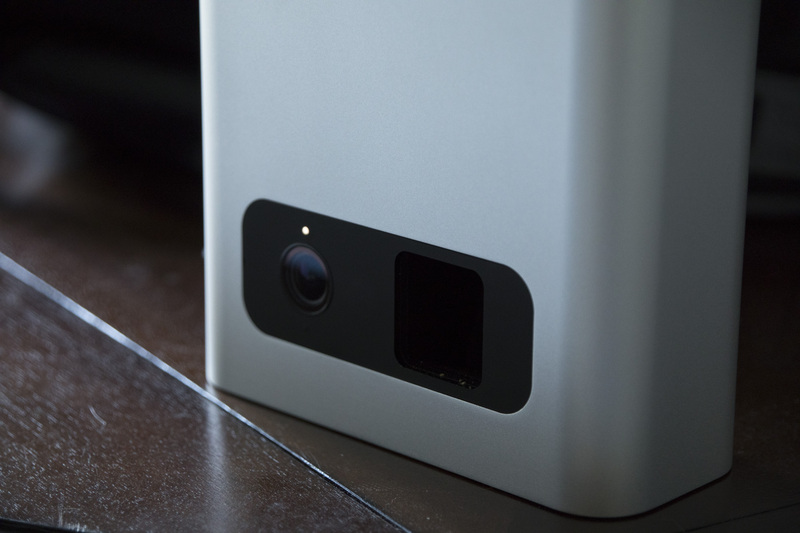 It has motion detection, with notifications that push to your device (which you can turn off if you like). Video quality is also not bad at all, compared to comparatively priced dedicated home security cams. If you’ve got a pet and you’re already considering a Wi-Fi camera, this might be a better option in terms of value for money. Other advantages nice things about the Petcube Bites include the multiple installation options – you can either use the rubberized base to just sit it on a flat surface, or use the pre-drilled holes on the back to simply slot it over mounting screws in a wall. Again, it’s large, so having options in terms of how to use it is a nice benefit for anyone concerned with how well it will (or won’t) fit into their home decor. Petcube Bites is available in three color ways for $229.99 right now from Petcube direct. Additional features, including historical cloud video storage, are available as part of additional paid monthly plans.